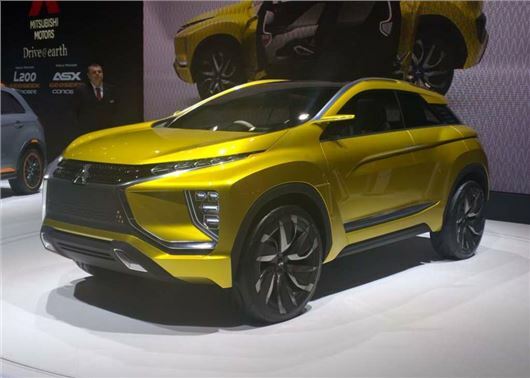 Mitsubishi has unveiled a small, pure-electric crossover called the eX-Concept at the Geneva Motor Show. While it isn’t set to go into production, it does preview technologies that will appear in future Mitsubishi models, including autonomous driving. It also previews the future styling of the firm's smaller crossover models. In terms of size, the eX-Concept is compact, like a Nissan Juke or Renault Captur – cars a production version would compete against. The interior is very much as you would expect from a concept, with no door pillars, light colours and clean, simple interface, including a touchscreen drive mode selector. The eX-Concept is packed with technology including the now normal array of safety gizmos, including lane keep assistance, autonomous emergency braking, a tiredness monitor and automated reverse parking. There is also an “augmented reality wind-shield” which displays information about the road ahead, driving conditions and hazards, but in a much larger space than a head-up display. The eX-Concept incudes autonomous driving modes, including an automated valet system. With this, the driver can leave the car then send a command using a smartphone app and the car will find a place to park, even preferring spaces with wireless charging capability if available. The autonomous modes also work at higher speeds. On the motorway the eX-Concept can drive itself, changing lanes and avoiding obstacles automatically. The battery pack is good for around 250 miles and powers two electric motors, one for each axle, making the eX-Concept all-wheel drive. Sensors mean that the car can detect changes in the road surface – such as when travelling from tarmac onto mud or sand – and will automatically change the all-wheel drive settings to suit the conditions. While the eX-Concept may not be available to buy in its current form, it is likely to inspire a production car in coming years. For those too impatient to wait, Mitsubishi has facelifted the current ASX, giving it a front-end similar to that of the eX-Concept. Click here for more information.